Added on December 20, 2013 by Leah Wolff. Since opening in May 2011, Court Square has operated as a non-profit exhibition and project space. We look back on three years of collaboration with artists, curators, and creative thinkers and makers, and hope for many more ahead. To celebrate, we're hosting our Third Annual Holiday Benefit Exhibition & Party, Image Search, from Friday, December 20 through Sunday, January 5. Works by over 40 artists will be on view at Court Square and on our website, and will be available via silent auction. Please join us for a festive holiday opening on Friday, December 20 from 7-10PM. If you can't make it in person, feel free to email us at info@ctsq.info for more details. Thanks to all participants and supporters and we look forward to more in 2014!!! Works available by: Andrew Adolphus, Becca Albee, Maria Antelman, Sebastian Black, Mary Walling Blackburn, Guy Ben-Ari, Blonde Art Books, Travis Boyer, Becky Brown, Nathan Catlin, April Chambers, Daniel Chew, Lisa Cobbe, Jeremy Couillard, Amy Feldman, Ernst Fischer, Jon Fischer and Benjamin Hill Matthew Fischer, Marley Freeman, Jesse Greenberg, Nora Griffin, Jeannine Han, MacGregor Harp, Caitlin Keogh, Alexandra Lerman, Liz Linden, R. Lyon and Jessie Stead, Peter Mandradjieff, Tracy Molis, Pat Palermo, Rory Parks, Kate Parnell, Stephanie Prussin, Jordan Rathus, Christin Ripleyv, Alan Ruiz, Bill Santen, Julia Sherman, Scarlett Stephenson Connolly, Molly Surno, Jonathan VanDyke, Matthew Wilson, Leah Wolff, Zoë Wright, and other TBA! Added on October 17, 2013 by Leah Wolff. A project organized by Paul Branca. Added on July 21, 2013 by Leah Wolff. Added on July 7, 2013 by Leah Wolff. Mirus Gallery is pleased to announce geometry of chance, a group show featuring work by morten andersen, claudio drë, gilbert1, felipe goncalves, brian guidry, francesco lo castro, mary mccarthy, darren mcmanus, grant miller, christine morla, robert moya, adrian navarro, nawer, lx one, joshua reames, mark schoening, vesod, and leah wolff. Geometry of chance will examine the use of mathematical principles as applied through these artists’ distinct bodies of work. Geometry has long held an important role in art history, with the two fields sharing the same foundational principles of line, shape, balance, symmetry, scale and proportion. It was through the application of these elements that the artists of the renaissance devised the technique of perspective. The application of perspective was the game-changer that defined western art movements for centuries to come, and for which even the most abstract artists are held accountable to when choosing to either embrace or challenge it in their practices. The artists in geometry of chance embrace geometry’s application through a variety of mediums and to varying effects, using geometric functions and understanding to communicate universal ideas that transcend individual knowledge or taste. Our understanding of geometry is hardwired into our evolution, for example studies have found that we view symmetrical features as more beautiful. This exhibition offers viewers the opportunity to see the application of these principles in their full spectrum; the binaries of art and math, emotion and intellect lose their duplicity and become two sides of the same coin. Our current era of information overload and constant technological demand offers little opportunity to consider the physical world as we once did; these artists strive to depict a world we can lose ourselves in and come out the other side more in touch with our physical selves. Geometry of chance offers the viewer the chance to re-examine the inner self, and reconnect with the inner explorer in all of us; the explorer that sought out the science of geometry in the first place. Grant miller’s artistic process mirrors the construction of history, recognizing the complexities that exist due to the multiple viewpoints that make up the sum of experience. As individual paintings, they represent a moment of clarity and a link in a chain of actions and events. Using a combination of structural elements, he achieves a formally defined space that speaks to the on-going internal cycle of information and processing that make up the human experience. In her two-dimensional paper construction paintings christine morla explores cultural signifiers through her use of filipino packaging, giving new meaning to what had formerly been considered trash. The weaving techniques she learned from her father are transformed through her use of these unconventional materials and geometric patterns, building upon her own cultural identity while commenting on the idea as a whole. Mark schoening’s vivid paintings speak to the overload and constant processing required in the information age. Embracing the barrage and reflecting on it, presenting an intellectual environment of synapses firing on all pistons, reacting to the constantly changing input surrounding us. His work acts as a product of the times, individual to the unique circumstances of lifestyle in the 21st century, and investigating our ever expanding ability to take in a multitude of simultaneous experiences. Leah Wolff addresses this technology induced disconnect from one’s surroundings with her mixed media works made from organic materials. Her practice seeks to extract meaning from the process of making, as our world becomes less inhabited by objects, and increasingly digitized and fleeting. Her art often resembles utilitarian objects such as tools, which act as an anchor to another, more tactile and physical era. Her rough hewed geometric shapes nod at the role of the natural order in technology, reminding the viewer that the origin and root of scientific pursuit lies in the natural realm, an area from which we increasingly detach ourselves. Mirus gallery is a dynamic exhibition space established by entrepreneur, paul hemming. The gallery features a program of contemporary artwork by emerging and mid-career artists in both solo and thematically organized group shows. Mirus gallery highlights work that emphasizes skill and process and aims to engage viewers on a sentient, emotional and evocative level. Community and collaboration by providing a live-in/on-site studio space for artists to make and exhibit work in a supportive environment, conducive to creativity. Added on June 28, 2013 by Leah Wolff. Added on June 1, 2013 by Leah Wolff. Added on March 25, 2013 by Leah Wolff. 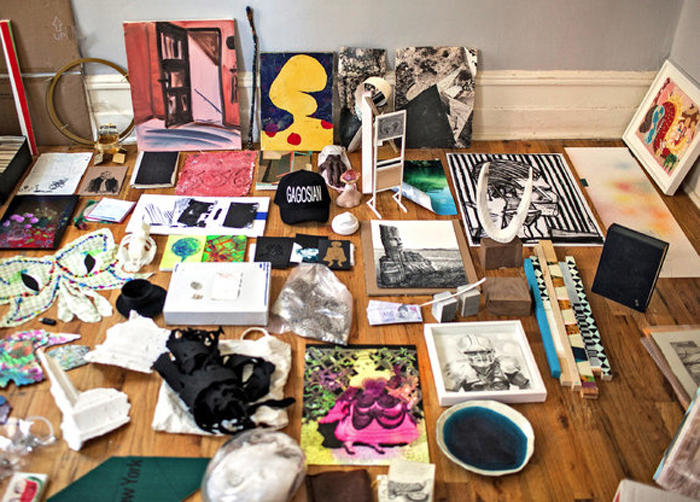 Featuring 77 of today’s emerging contemporary artists living and working in New York City, Thanks includes sculpture, video, drawing, painting, photography, prints, studio objects, art making byproducts, and inspirational objects all discreetly acquired by Adam Parker Smith. The show was featured in this New York Times article by Melena Ryzik. Beginning with a series of studio visits, Smith set out with the clear intention of “acquiring” work for the exhibition. However,he concealed the true concept, premise, and even timing of the exhibition from the artists. Through various surreptitious means, a work of art or object was taken from each artist’s studio. The pilfered work is not any random object but rather one that explicitly relates to the artist’s wider practice. For example, Micah Ganske, who designs and produces sculpture with a MakerBot 3D printer, is represented by one of his innovative sculptures. Two weeks prior to its opening, the artists were informed of the exhibition. Only then were they let in on the true concept and scope of the exhibition. Presented with the choice – if the artist agreed, they would be included in Thanks; if they refused to give permission, works were to be returned immediately. However, all invited artists agreed to participate in Thanks. Works are displayed on viewing tables in the gallery akin to anthropological exhibits in a natural history museum. Thanks is, after all, a cross-section of the contemporary art world & Adam Parker Smith’s circle. This exhibition combines the work of a large portion of the emerging New York art scene, as well as Smith’s own personal practice, combined with his trademark sense of humor. Ideas of appropriation, ownership, and how artists influence each other are brought to the forefront in Thanks. The role of the curator is highlighted and questioned, and some of the social dynamics of the art world – artists who live and work together as colleagues, friends and competitors – are laid bare, shedding light into what it is like to be a practicing artist in New York City. Added on March 3, 2013 by Leah Wolff. Please join us this Saturday, March 8 from 2-8PM to celebrate the opening of CORRESPONDANCE: WORKS AND WRITINGS BETWEEN NEW YORK CITY AND CATSKILL, at PS Hudson, Catskill, NY. Organized by PS Hudson and Lisa Hayes Williams. In French, the word correspondance refers to connection points between trains, or, like its English translation, an exchange of letters or messages. It can also refer to similarity or analogy between two or more things. Publication Studio Hudson’s inaugural exhibition takes this multivalent word in considering two places–New York City and Catskill–as points of exchange between people, ideas, and objects. As a newly established book design, printing, and publishing studio in Catskill, NY, PS Hudson welcomes a group of artists and collaborators from the Greater New York area to send–via post or train–works of any medium as an initiation of dialogue. Featuring over 40 participants, Correspondance is the first in a series of exhibitions that seeks to realize the philosophy of publication as the creation of a public, a common space where all are welcome and enter into dialogue on equal terms. An exhibition held right on the heels of the first will present responses made by Hudson and Catskill area artists. Publication Studio Hudson designs, prints and binds original books by authors and artists we admire. Using a digital printer, paper trimmer and perfect-binding machine we make novels, poetry collections, artists’ books and more. We are not tied to any particular genre and in fact thrive on exploratory collaborations. PS Hudson launched in January 2014 and joins ten other independent studios in North America and Europe which also approach the work of publication as a political strategy: the creation of a public, again and again, through bookmaking and other means. Transparent work processes and hosting events in real space are also central to our vision of the publisher’s role. We operate out of spaces in the river towns of Hudson and Catskill, where we also facilitate hand papermaking processes, sew, screen-print, do sculpture, play music, and host workshops and exhibitions. Find out more at publicationstudio.biz and visit us at 460 Main St., Catskill NY. Curator Lisa Hayes Williams is a New York based art historian and co-founder of Court Square, a project space in Long Island City devoted to supporting the production and exhibition of new work by emerging artists, writers, and curators. Added on January 20, 2013 by Leah Wolff. Leah Wolff, Pooneh Maghazehe, Grayson Cox, David Brooks, Seth Scantlen, Mismembered, Umbrella Men, Heavy Birds, Jared Friedman, Jess & Eric, Alex DeMaria, Anna Morgan, Fauning, more! Artists have been asked to tackle various components of 90"s Mtv unplugged set design, drapery, lighting, flora, candles, etc. Musicians will perform covers of covers performed at various Mtv unplugged shows. Added on January 3, 2013 by Leah Wolff. Superposition (Explainer) at Scaramouche, 2013, Performance, 20 minutes. As part of the exhibition It's Been Hours at Scaramouche I am holding a performance-lecture in which I diagram a superposition using an overhead projector. In Quantum Mechanics, a superposition points to the problem of measurement, and depicts the behavior of particles as fundamentally distinct from what we know to think about or understand. It's Been Hours will be on view at Scaramouche until Sunday 1/13/2013. Added on November 11, 2012 by Leah Wolff. Leah Wolff (b. 1984 Cleveland, OH) lives and works in New York. She received an MFA in Visual Arts from Columbia University in 2011, and a BFA in Printmaking with honors at the Rhode Island School of Design in 2006. Recent exhibitions include NADA New York in the ARTIS rooftop project “The Artis Shuk”; “Creative Nonfiction” at Kunsthalle Galapagos, New York; “Block Party” at SculptureCenter, New York; and “Bread and Roses” at Minshar Gallery in Tel-Aviv, Israel. Added on September 13, 2012 by Leah Wolff. SculptureCenter is pleased to announce the first LIC Block Party, presented with the Purves Street Block Association, this unique event features art and entertainment for all ages. SculptureCenter welcomes all guests free of charge. For location details and directions by public transportation and car please visit the website. Added on September 8, 2012 by Leah Wolff. Added on August 23, 2012 by Leah Wolff. Kunsthalle Galapagos celebrates its one year collaboration by inviting seven people who they worked with over the past year to come together to curate a show. Creative Nonfiction is curated by Adam Fowler James Moore, Naomi Reis, Jacob Rhodes, Hannah Smith Allen, Ben Sutton and Pete Watts. The show features the work by Lienê Bosque, Rachel Frank, Jack Henry, Cesar Chavez Lechowick, Elissa Levy, Julia Oldham, Becky Suss, Leah Wolff and Ashley Zangle, nine artists who create new dimensions through materials, re-tell fantastical stories with science and daily object and search for truths in the unexplainable. Adam Fowler James Moore, Naomi Reis, Jacob Rhodes, Hannah Smith Allen, Ben Sutton and Pete Watts.